Mike Babcock knows the clock is already ticking on this iteration of the Maple Leafs. And in the wake two of their worst performances in recent and not-so-recent memory — games pockmarked by varying degrees of disinterest, lack of attention to detail and defensively frailty — the time to get back on track is now. Mike Babcock knows the clock is already ticking on this iteration of the Maple Leafs. And in the wake two of their worst performances in recent and not-so-recent memory — games pockmarked by varying degrees of disinterest, lack of attention to detail and defensively frailty — the time to get back on track is now. "We understand what's at stake for us," said Toronto's head coach. The roster as its currently constructed won't be the same next September. They never are in the salary cap era. Jake Gardiner is likely to leave this summer, KasperiKapanen and Andreas Johnsson will need big, perhaps unaffordable raises, and MitchMarner, although expected to re-sign in Toronto, could be one of the most sought-after restricted free agents to hit the open market. "We understand our opportunity is here and now," Babcock added following Thursday's practice. "Next year in sport never comes." With just 12 games left on the schedule and home ice advantage in the first round of the playoffs still up for grabs, the Leafs also understand they don't have a lot of runway left to get things right. "There's nights where it looks like we're ready for (the post-season) and there's some nights that look like we're not ready for it all," said Marner, the first Toronto player to record 60 assists in a season since Doug Gilmour. "We've got to make sure we dial it in. "It's a different beast in the playoffs. We've got to make sure we're ready." 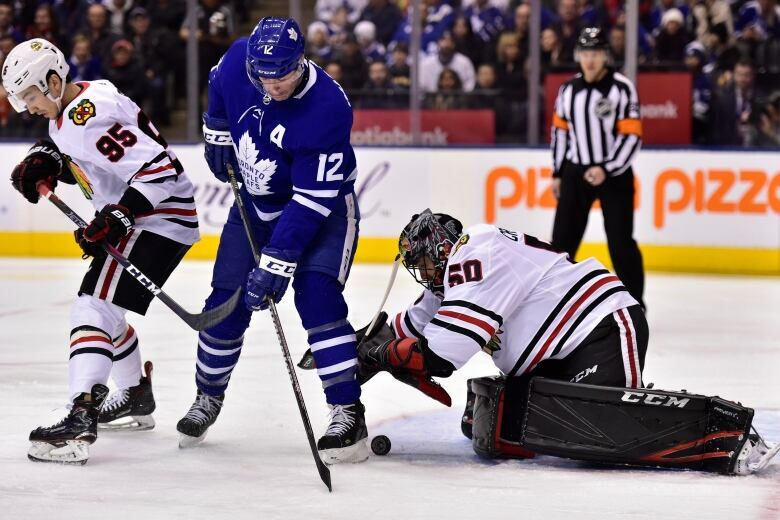 They certainly didn't look that way in Monday's lethargic 6-2 defeat to the well-oiled Tampa Bay Lightning or Wednesday's sloppy and embarrassing opening against the Chicago Blackhawks that saw the Leafs fall behind 4-0 after the first period and trail 5-0 late in the second before a chaotic rally fell just short. Perhaps even more maddening, the back-to-back losses came on the heels of a successful three-game swing through Western Canada where Toronto picked up five of a possible six points, and a 6-1-1 stretch overall. "(Against Tampa) we had no energy and we never, ever got going at any time in the game to show any energy," Babcock said. "We just never got it. We didn't have it. "(Wednesday) was one of those games where we didn't score early, they did, and it took us a while to get to the level we wanted to play at." Toronto was four points back of Boston for second in the Atlantic Division before the Bruins visited the Winnipeg Jets on Thursday. The Maple Leafs need make up ground or be faced with starting on the road in Game 1 against their rivals for the second consecutive spring. "We just need to regroup," said Leafs centre Auston Matthews, who scored his 106th career NHL goal in his 200th game Wednesday. "It's all within the room. What we need to change comes within us as players. "You go through these little lulls ... that's the way it goes sometimes. We just need to pick each other up and make sure we hold each other accountable." While the club still has formidable punch up front with Marner, Matthews, John Tavares and William Nylander, there's no denying the loss of Kapanen, who has missed the last two games with a concussion, is significant. 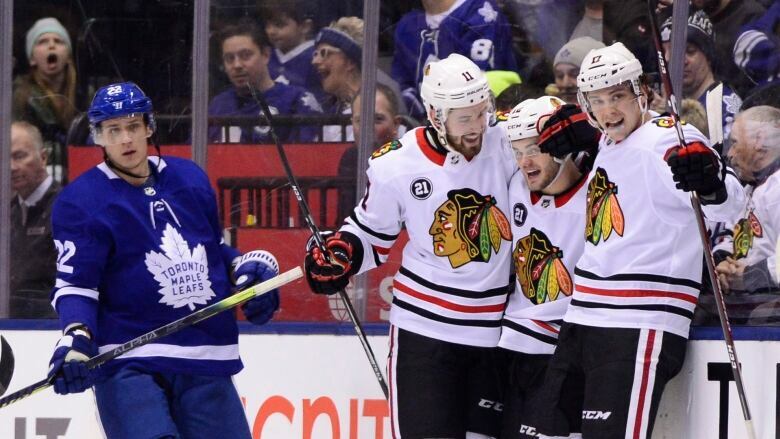 Fellow winger Zach Hyman (flu) could return to the lineup Friday against the Philadelphia Flyers — like Chicago, a desperate team looking to make a late playoff push — while the Leafs also continue to deal with absence of Gardiner (back) and fellow defenceman Travis Dermott (shoulder). "You put our uniform on, you've got to be ready to go," Babcock said of any notion his group has an excuse. "Injuries are all part of sport. It doesn't matter who's playing. We expect a lot from our group. "It doesn't matter if you've played three games, five games, 10 games or you just got called up." Philadelphia is 6-1-1 over its last eight, including 5-1-1 since dealing winger Wayne Simmonds to the Nashville Predators at the trade deadline, but sat five points out of the Eastern Conference's second wild-card spot heading into Thursday's slate of games. 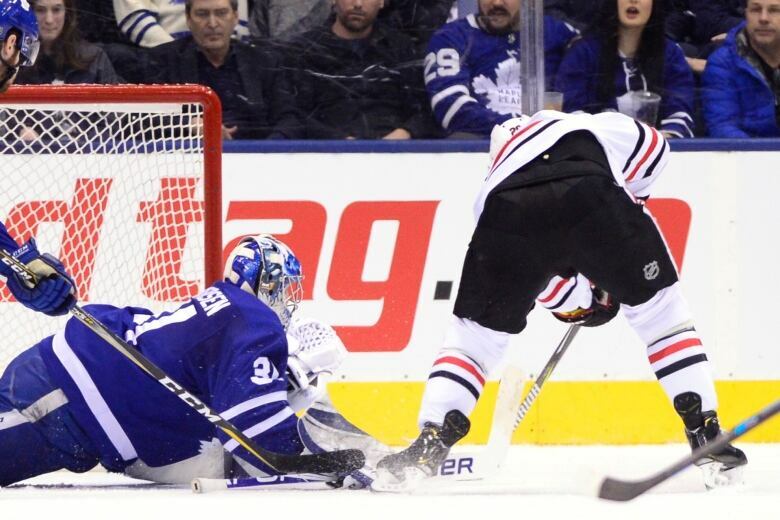 Much like the Blackhawks, the Leafs can expect a tough test. "They're fighting to stay in it," Toronto centre Nazem Kadri said. "You've got to come prepared." The opportunity is there for the Leafs. Seven of their next eight opponents currently sit outside the playoff picture, including two road games against the last-place Ottawa Senators — Saturday and again on March 30. "We had 'er going real good and then suddenly we've come off it for two games," Babcock said. "It's just a matter of getting back on track. Every night in the National Hockey League you play a good team that's real hungry." The Leafs could use some of that hunger.